The spiritual inspiration for DEEP is based on the life and times of the seventh Sikh Guru, Guru Har Rai, (click on link for more information). Guru Har Rai played a major role in the development of Kiratpur in Panjab and turned it into another major centre for the Sikhs. Located on the banks of the Sutlej River, Kiratpur was developed by Guru ji into a town of parks and gardens. He arranged for the planting of flowers and fruit trees all over the area. This created a wholesome environment, attracting birds to the town and turning it into an idyllic place to live in. Guru ji established a large clinic and a pioneering dispensary called Chikitsalya. It was here that treatment was given to sick, infirm and old people. It also included an herbal medical research centre with herbal gardens at Kiratpur. Several rare herbs and medicines could be found in Guru ji’s clinic. According to Prof Manjit Singh, ex-Jathedar of Takht Kesgarh Sahib, these herbal gardens in Kiratpur Sahib are now being retrieved with fresh plantings with the help of the forest authorities of Punjab state. The Sikh traditions also speak of Dara Shukoh’s protracted sickness. His father, the Mughal Emperor Shah Jahan then requisitioned some Ayurvedic herbs as recommended by the royal physician from Guru Har Rai. These herbs were available at Kiratpur and were said to be harrad (Chebulic myrobalan - Terminalia chebula) and laung (cloves - Syzygium aromaticum). Guru Har Rai used go for hunting most afternoons in Kiratpur. Although he was found of hunting, it was said that he never killed or hurt any animal or bird. In fact, Guru ji had issued special instructions to his men not to kill any animal. They used to catch the old, week and sick animals and bring them back to Kiratpur. There, Guru ji kept the wild animals in his animal sanctuary. These animals were given medical treatment and cared for at the animal clinic. When the animals had recovered, they were once again set free in the forest. 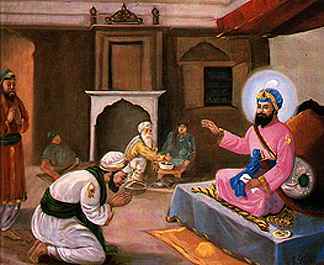 Whenever Guru Har Rai had to kill some animal, it was for relieving that animal from extreme pain or for spiritual freedom of that animal. Once Guru ji saw a snake that was in extreme pain and in old age. He was being attacked by ants and was shaking his head and tail with pain as if he was requesting Guru ji for help. Guru ji killed this snake with an arrow and relieved it from pain as well as from the cycle of birth and death. Bhai Har Rai as a child always wore a heavy gown. One day while passing through his grandfather Guru Har Gobind&apos;s garden, the folds of his flowing gown struck a flower. This fell down, torn from its branch. Guru ji saw this and said to Har Rai, “My son! Always go about with due care, lest you disturb the slumber of union of some blessed ones, and tear them away from God as thou hast torn this flower from its branch." This thought affected his tender heart and brought tears in his eyes. From then on, Bhai Har Rai always gathered the folds of his gown in his hand wherever he went. After that he also always resolved never to harm anything in the world. On one of the Guru Har Rai&apos;s tours, he stayed at Mukandpur in the present district of Jalandhar. There he drove a bamboo shoot (bans) into the ground in memory of his visit. It still survives today as a stately tree. Ghakka village is situated in Tehsil Shakkargarh, District Narowal in Punjab Province. Guru Har Rai sat beside a Tahli tree (Shisham - Dalbergia sissoo) and under the shade of a Ber tree (Jujube - Zizyphus jujuba) in this village. Guru Ji stayed for a few days here. The holy shrine is now called Gurdwara Tahli Sahib. However, the Tahli tree has withered away and only the Ber tree is still there. “The Guruship is like tiger’s milk which can only be contained in a golden cup. Only he who is ready to devote his life therefore is worthy of it. Let Ram Rai not look at my face again”. "Jab kabhu Shikar kash mare, mano mukat karta ko mare"